Physical characteristics: The white-breasted mesite, also known as the white-breasted roatelo, is about 12 inches (30 centimeters) in length. Males weigh approximately 3.5 to 4 ounces (99 to 113 grams) while females are somewhat lighter. White-breasted mesites have reddish brown backs. The throat, eyebrows, and breast are a pale cream color. The neck area is sometimes gray. White-breasted mesites also have black crescent-shaped markings scattered on the sides of the breast and upper belly. Geographic range: White-breasted mesites are found only on the large island of Madagascar. 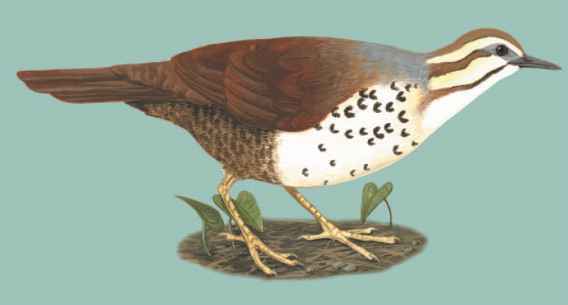 Habitat: Where it occurs in western and northern Madagascar, the white-breasted mesite occupies dry, deciduous forests with sandy soils. The eastern portion of its range is characterized by more humid rainforest. Diet: White-breasted mesites primarily eat invertebrates and plant seeds. It searches for these food items in the leaf litter and low bushes. Behavior and reproduction: The white-breasted mesite is a secretive species that is most commonly found on the ground. The species does not migrate, but remains near its breeding grounds all year. White-breasted mesites are often found in groups of approximately three individuals, frequently a male and female pair and their most recent young. White-breasted mesites are territorial, meaning individuals defend their territory from others of the same species. The white-breasted mesite is believed to be a monogamous species. White-breasted mesites build nests 3 to 9 feet (0.9 to 2.7 meters) off the ground. Their nests are generally simple platforms of sticks. The female lays one to three eggs during the breeding period between October and April. White-breasted mesite chicks are precocial, and young remain with their parents for up to a year. White-breasted mesites and people: White-breasted mesites are sometimes hunted for meat. Because of their small size, however, hunting occurs only irregularly. Langrand, O. Guide to the Birds of Madagascar. New Haven, CT: Yale University Press, 1990. Morris, P., and F. Hawkins. Birds of Madagascar: A Photographic Guide. East Sussex, U.K.: Pica Press, 1998. "Family Mesitornithidae (Mesites)." Animal Diversity Web. http:// animaldiversity.ummz.umich.edu/site/accounts/classification/ Mesitornithidae.html#Mesitornithidae (accessed on March 29, 2004). "Mesites, Roatelos." Bird Families of the World, Cornell University. http://www.es.cornell.edu/winkler/botw/mesoenatidae.html (accessed on March 29, 2004). 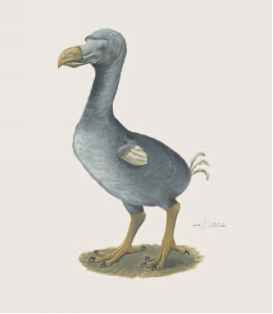 "Mesitornithidae (Mesites)." The Internet Bird Collection. http:// www.hbw.com/ibc/phtml/familia.phtml?idFamilia=41 (accessed on March 29, 2004).